Remember in hope for Memorial Day. 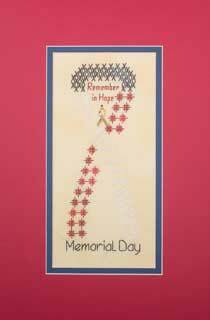 Shown in traditional red, white and blue, with yellow for remembrance, and a memorial ribbon charm. 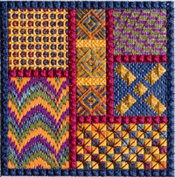 Three stitches - oblong cross, diagonal broad cross and woven upright cross - outline the ribbon shape in Crescent Colours Apple Fritter, Wavy Navy and Toasted Marshmallow, on 28 ct. African Daisy hand-dyed Jobelan (can be worked on 14 ct. as well). Design is 3" x 7 ¾", 43 x 109 stitches. Optional color choices included to make a remembrance ribbon. Finished size 3" x 7 ¾"